﻿ Best Family China Tours, Friendly China Travel Packages for Families. Designed specifically for family visiting with kids, toddlers or baby, these private, affordable private luxury China family tours combines odyssey Chinese culture, interesting history and great family fun to bring you the holiday experience of a lifetime! These meticulous planned China family tour packages features China's most ancient capitals Beijing and Xian, a world leading vibrant city Shanghai, a leisure visit to China's most beautiful and natural countryside Guilin and Yangshuo, a soft adventure to hike on Yellow Mountain, a close contact to the world-renowned giant Pandas in Chengdu. Wherever you are planning to visit, our team can customize an interesting China family tour to meet your specifications features well selected sights, affordable luxury, boutique hotels or apartment with kitchen…Planning a family tour to China with your kids take a little more work, but in the end, it's all worth it! Lots people agree that travel with family members is a Time to make memories. During a vacation, one learns how to take care of his or her family members, the kids or the old. You need to take care of them carefully as you must be a considerate son or a daughter. Besides that, the most important part of the travel time is to enjoy the fun of the journey. If you arrange a right China tour with a right travel agent, you will have a memorable moment. Travel with us, we will take care of your family well. Tell us your plan and your concerns; we will make you feel at home. 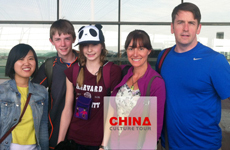 Customize your very own China family tour by China Culture Tour, a reputable, family-friendly China tour company! How to make a family-friendly tour package suitable for us if we travel with our kids? If you are planning to visit China with your kids, we at China Culture Tour can organize the ultimate travel experience. Perhaps your young charges will enjoy learning kite making and flying or calligraphy, Chinese Kungfu Performance and basic Mandarin language. They may also enjoy a visit to a local family and make Chinese dumplings or school or more energetic activities such as bicycle riding on the Ancient City Wall or watch a Shadow Play in Xi'an, hiking along Li River or on the Terraced Fields in Guilin. How about a visit the the Giant Panda Breeding and hold a baby panda in Chengdu? What's the best time for traveling with kids in China? China is suitable for traveling with kids all year round. In terms of thermal comfort, the best time is spring and autumn. Summer is too hot, while winter is too cold, but February is a good time for kids to participate in the celebration of Chinese New Year and learn about traditional Chinese culture. How to plan a trip to China with kids? Plan your private itinerary with easy pace to avoid tight schedule and fatigue. Find some interesting and kid-friendly places to go and to do, such as parks, playgrounds, zoos, dumpling making, and calligraphy learning for them to run and take a break from the trip. Do I need to mentally prepare my kids for the trip? It is very necessary to mentally prepare your kids for the trip. You can ask them what they know and like about China, describe the fun part of the trip, such as visiting the Great Wall, and taking photo with giant panda. Introduce, or better illustrate the places you will visit on the map. Guide your kids to learn about the destinations, and let them involve in the trip planning. Make a list and ask them to join in packing. Help them think what to bring for their trip to China. Bring along one or two of their favorite toys or stuff, and let them know about it, which will pacify and entertain them during the trip. Bring a change of clothes for change of weather, some common medicines, and mosquito repellent. Kids easily get bored over time. Play games and plan some activities for them, don’t wait after they start to get bored and disgruntled. Prepare some little surprises to give them when you reach a certain destination, to keep them in an anticipating and happy mood. Consider wearing similar clothes or clothes with the same colors, to help your kids recognize and also make them feel fun. Prepare some food and snacks such as cookies and milk powder, and bring along with you. Bring a thermal mug, so that you can make milk whenever hot water is available. A little forethought is needed when it comes to excretion issues of kids at a very young age. Prepare enough tissues, wet wipes, disposal bags, diapers and changes of clothe. Spare enough time for your kid to take a rest during the trip. Keep an eye on him/her when at rest. To enhance your kid’s memory about the trip, besides writing a travel diary, you can also buy postcards at each place you visit, and let your kid write or draw whatever he/she wants to regarding the trip. How to avoid getting lost with your kids? Prepare a contact card and let your kid carry along. The contact card should list kid’s name, parents’ name, phone number and hotel name of each city you will stay at. Tell your kid to show the contact card to the police if he/she gets lost. A wristband or watch with GPS is convenient for locating your kid. Parents should keep an eye on the kid any time, especially in crowded public places. What clothes to prepare for kids? Make sure you bring enough clothes to deal with the change of climate and environment. Always bring a change of clothes for your kids. Prepare for weather changes by dressing in layers. It is necessary to prepare rain-proof clothes and umbrella when traveling in spring and autumn. Prepare some common medicine for kids. Before the trip, ask your child’s doctor to prescribe some common medicines for anti-fever, anti-diarrhea, anti-nausea or cold cure, and bring them along with you. Go to the hospital immediately if it is in serious condition. How to avoid risk during the trip? During the trip, there might be some places with potential risks that you need to be aware of. On the Great Wall, mind the bricks and stone beside your feet, and don’t stand on the edge to take photos. On the ancient city wall of Xi’an, watch out for electric golf carts and pedestrians when you ride the bike. When you are on water vehicle, like on the Yangtze River cruise, Li River cruise or bamboo raft, take care not to fall into water. Mind the traffic and road condition when you cycle in the countryside of Yangshuo. When you cross the road, walk on zebra crossing and look both sides even the green light is on. Require a car child seat when you use a car during the trip. 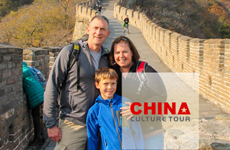 China Culture Tour has served thousands of families who traveled to China from all over the world including the United States, Australia, Canada, the United Kingdom, India, Singapore, etc..
Tailor-make a China Holiday Tour for Your Family!